Act as early as possible - within days or at a minimum within weeks of birth. DO NOT WAIT UNTIL THE CHILD IS OLDER. Read as much as possible and consult numerous doctors. Get the right (not first) doctor as early as possible. I would advise seeing a clubfoot specialist as oppose a general orthopedic doctor. I would advise using the Ponseti method (as strictly applied by a Ponseti clubfoot doctor) before considering surgery, although in some circumstances surgery is necessary. A doctor who is strictly following the Ponseti method will be able to advise you on the correct approach. Not all doctors practise the Ponseti method to the letter, although they may call it the 'Ponseti' method. To optimise your chances of success using the Ponseti method then visit a doctor on the list from the Ponseti webpage - USA - Rest of World. The extra travelling will be well worth it and you'll have peace of mind that the treatment is as it should be. If the doctor is using an inferior or incorrect/unpractised 'Ponseti' method then the result may not be perfect (and could even cause problems). Check your doctor is actually carrying out the Ponseti method, casting and bracing correctly, and not just calling his own method the 'Ponseti' method. A good guide as to whether your doctor is actually following the Ponseti method can be found on the website clubfootclub. It seems that many people start treatment and then realise it is not correct, thus wasting an important month. I can't express enough how important it is to find a doctor properly trained to carry out the Ponseti method and who follows it precisely from casting to braces. A doctor using a slightly different 'Ponseti' method may not have the same success rate and could potentially damage the child's foot. One of the key principles of the Ponseti method is to over-correct the foot. This stretches the tendon at the back of the foot. See the Photo below left and then put your foot in the same position - it stretches the tendon and does not hurt - it is a natural position. If the foot is instead corrected by having it in a straight line, but with the toe end pushed up then foot problems can occur - this is not the Ponseti method of over-correction. Be very familiar with the Ponseti set of casting positions and ensure your doctor is following them. The foot is corrected to be straight, pointing down and then over-corrected and flat. Many doctors correct to straight and flat - this is wrong and is not the Ponseti method. ABOVE LEFT: Atom's second to last cast (equiv. 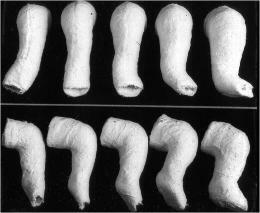 to last Ponseti Cast); ABOVE RIGHT: The Ponseti Casts - This is the correct method of casting to correct the foot - if your doctor is not using this sequence then your doctor is not using the Ponseti method. Note that the casts must cover the whole leg. Note the middle cast - when the foot is straight it points down - only when over-corrected is the foot brought to a flat position. We have found the most effective way to remove the plaster was using 2/3 to 3/4 vinegar to warm water. This is more vinegar than recommended by the doctor. See the casting page. If you cannot afford treatment, then some treatment is better than nothing - at least seek some advice from an orthopedic doctor. Spending a small amount of money now will save on much bigger care or correction bills later and should mean your child can live a normal life and go on to support his parents, as oppose to needing support due to lack of employment opportunities with the uncorrected clubfoot. It does not cost much to have an orthopedic surgeon put the baby in a series of casts (say $15 a cast in the Philippines, although a clubfoot specialist will charge more and you are paying for the valuable expertise). You could also advise your doctor on the correct casting sequence/method, but ideally you want experienced hands doing this, so this is very much a compromise where money/travel is an issue. Pull out all stops - contact relatives and seek donations/sponsorship. A cheaply made local splint (say $20 in the Philippines) is not ideal, but may be better than nothing at all. With the ingenuity in many developing nations I would bet you can have a similar splint to the Ponseti one custom made for a fraction of the price if you're determined. Maybe you will be able to get a second hand proper Ponseti AFO Brace (or similar) for a minimal price or even free. 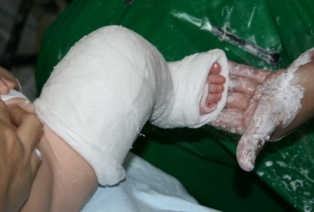 Make contact on international Yahoo clubfoot groups or through clubfoot doctors who will have other patients that have out-grown their splints. TRY EVERYTHING! Also, perhaps in 2011, proper Ponseti-style braces that are locally made in the Philippines (and therefore much more affordable) may be available. Do not give up - and if your child is older, remember treatment can still be sought - it's not as ideal as treating a baby, but treatment is still possible. Try and get into the practice of donating your old braces. Many children in developing countries are not from families who can afford braces. It is heartwrenching to see children who are disabled for the sake of a few bucks or equipment donation. Unnecessarily disabled children are common place in the Philippines and other developing countries. Do not let your old brace gather dust when it could be changing the life of a child somewhere in the world!